I’m feeling like Bilbo Baggins, home from the road, feeling tired but satisfied, glad to get back into life in our shire. We had a most wonderful roadtrip/book tour. 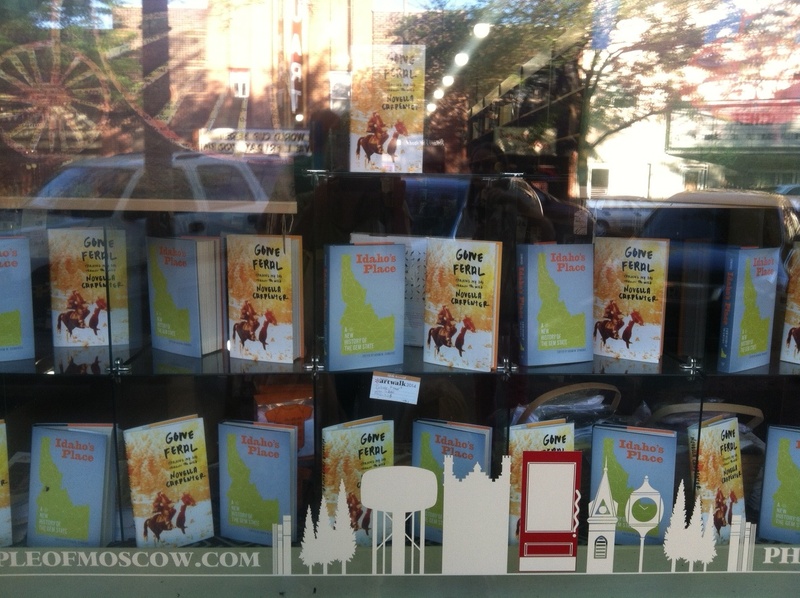 Here’s a shot from Bookpeople’s window in Moscow, ID. My sister and her daughter, Amaya, came with me and Frannie for the ride up to Seattle, then over to Idaho and down through Nevada. We had so many hilarious and awful things happen, it’s hard to remember everything. The first night in the tent, Frannie projectile vomited everywhere; at one Seattle reading only 3 people showed up (and I knew two of them–hi Joan and Kate! ); one night the kids ate ice cream sandwiches for dinner. Riana was the best co-pilot ever, she dutifully climbed in the back to fill up Franster’s milk jar and kept the kids entertained while I drove. Amaya and Frannie were best cousins, immediately squabbling followed by hugging. Thanks to everyone we met, old friends we got to see again, meals cooked in our honor, and for all those beds we crashed on–couldn’t have done it without you! I didn’t blog from the road, but my sister did at her flickr site. Stay tuned for events and happenings in September, when Gone Feral will rise again.